your role at Tavern on the Green? KH: My role is to be the liaison of our ownership. We have over 300 staff members over a number of departments and a lot of things going on! I always joke that Tavern may be one restaurant, but it’s really 5! At any given point, we can have a wedding reception going on in our South Terrace, we can have our To Go Window open, another party in our South Wing, have a la carte in our Bar Room and Central Park Room and then have a full Courtyard with people coming in off of the Park and enjoying lunch or brunch. So it’s one building, but it’s really telling many stories at the same time. So my job is to help our ownership put that all together and what that looks like to ultimately hone in on the guest experience. I make sure that all of our departments whether it’s the front of house or back of house is firing on all cylinders and really just providing that really magical Tavern experience. I know that you said before that people may have come here years ago – we have guests that come in that say, “oh this is my first time back since my friend’s wedding 10 years ago.” Or they will say, “I have never been here, but my grandparents got married here.” Or that their mom proposed to their dad here. There are a lot of really special family moments that we enjoy having them as Tavern moments as well and being able to speak to that. Simultaneously, being a part of NY. 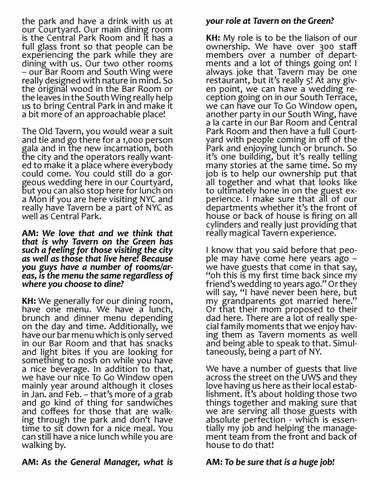 We have a number of guests that live across the street on the UWS and they love having us here as their local establishment. It’s about holding those two things together and making sure that we are serving all those guests with absolute perfection - which is essentially my job and helping the management team from the front and back of house to do that! AM: To be sure that is a huge job!